Isn't everything brighter with flowers?? They make you smile, let you savour the moment! Our"Flower Shoppe" Collection is intended to do just this! 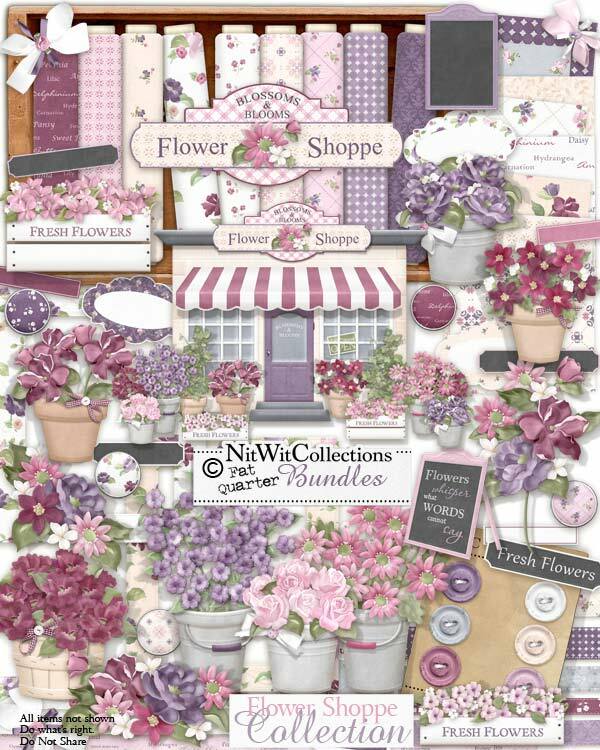 Blooms of flowers make up this richly coloured kit that would be perfect for so many uses. Be it a garden layout or card, possibly for a wedding invitation, a birthday or even a home decor theme. Think about what makes you have that warm feeling in your heart and it will flow from you into your creation!! 2 Floral crates....wouldn't these be wonderful window boxes!! 1 Flower shoppe - if we had one like this down the street I would be there every day to browse and soak in the fragrances! 3 Frames to display your photos or frame in a main element on your card or layout. Why not just print this frame to use as a mat in one of your photo frames around the house?? 3 Journal labels decorated with...what else...flowers! 1 Sign - "Flower Shoppe" - maybe this would be perfect to add to your garden photo?! 1 Sign - "Fresh Flowers"